Yan Oya, a mega-irrigation project in Trincomalee district of Sri Lanka has so far destroyed over 5400 hectares of farm and forest land, including 238 water bodies and displacing over 340 families, according to MONLAR – a member of La Via Campesina. As the project inches towards completion, most of the affected families allege that they have not been adequately rehabilitated and compensated for their losses yet. About 85 families have been provided alternate land to resettle in, but with little or no infrastructure facilities. 960 farmers in the region have lost their paddy lands and none of the peasant families have cultivated since four years, thus losing their livelihood and food security. The project is being spearheaded by a Chinese corporation – China CAMC Engineering CO LTD – with all major decisions on the project being taken from Shanghai, according to this report in News1st. The report also states that lands that will be submerged through the project include lands of archaeological importance as well as many wildlife habitats. The creation of this project could lead to an intensification of the wild elephant conflicts being faced by residents of the Anuradhapura and Trincomalee districts. 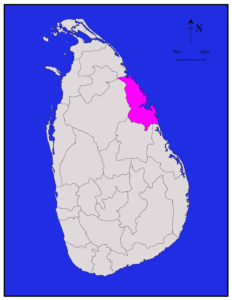 MONLAR has reached out to the affected families in 12 villages and linked them to the People’s Planning Process in the North Central province – and informing them of their rights under the Sri Lankan law and the procedures and strategies to achieve the rights. In the meantime, the excavations during the irrigation project has revealed an area with large deposits of sand. Since over a year, illegal mining of these sand has been taking place with little or no environmental safeguards and activists allege full collusion of State’s officials in this process. After protests, it is reported that the State government cancelled the licenses issued for mining, but locals allege that it is still being carried out illegally.